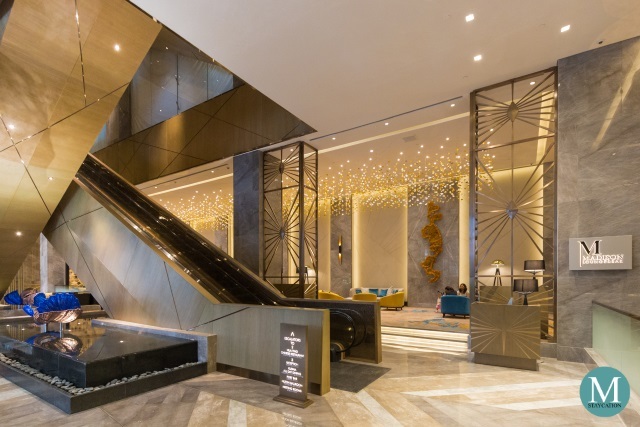 Hilton Manila Hotel (马尼拉希尔顿酒店) is a luxury hotel located in Manila's Newport City complex and forms part of the Resorts World Manila integrated resort. The hotel stands right across the Terminal 3 of Ninoy Aquino International Airport, the main international gateway of the Philippines. 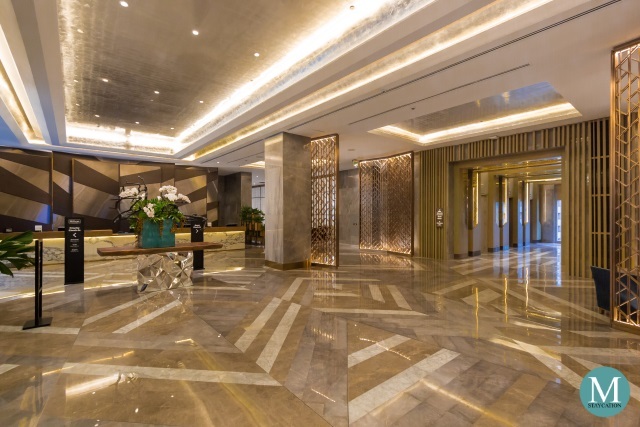 The common areas as well as the meeting and dining facilities of Hilton Manila are located on the first three floors of the property. 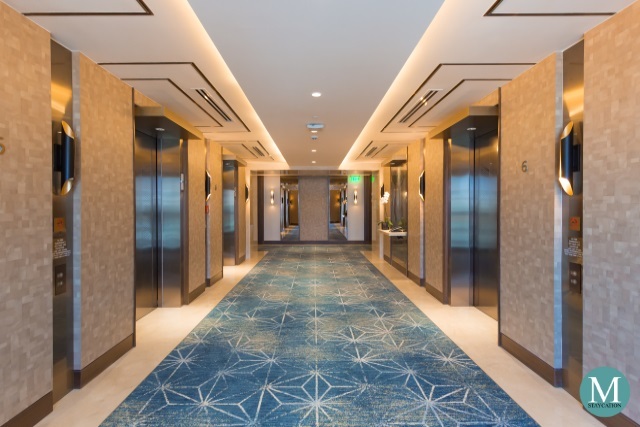 Guests can either take the escalator or the elevator to access the second floor and the third floor. 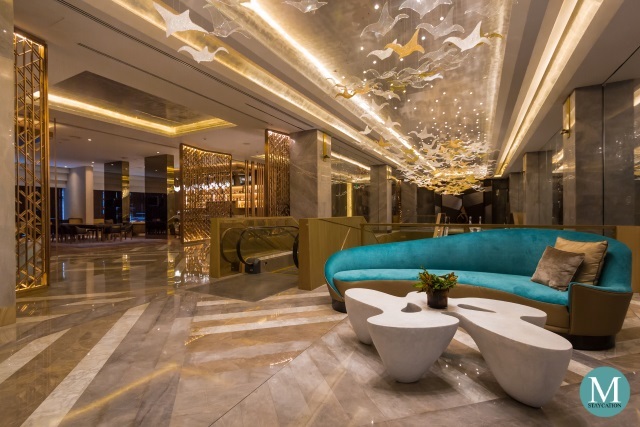 The common areas feature the use of marbles and metal panels. Touches of Filipino design are also evident such as the carpets inspired by the hablon weaving of the Philipppine province of Iloilo. 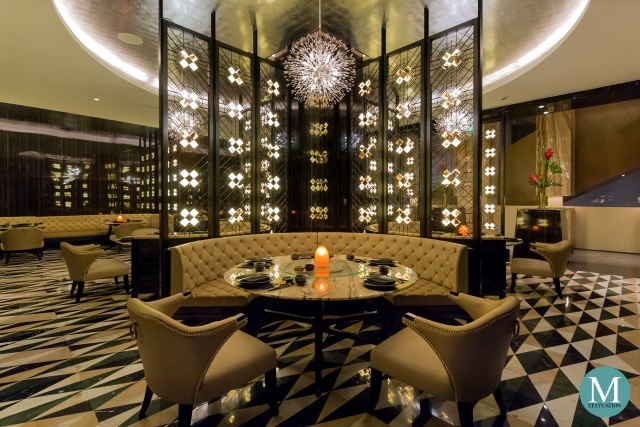 Art pieces by French-Filipino designer Olivia d'Aboville add a touch of modern Filipino design in the interior. 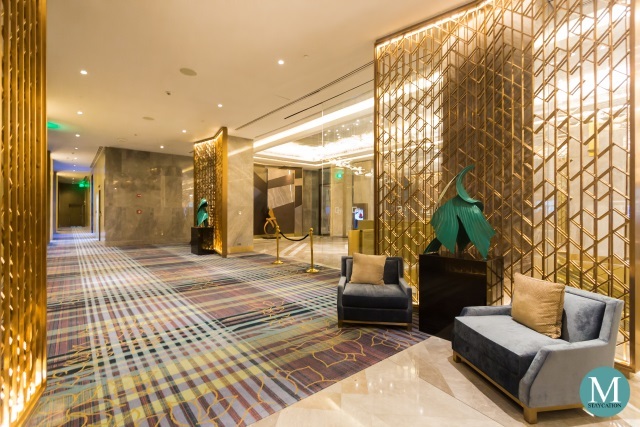 With solid geometric patterns on the floor and walls coupled with brass colored metal panels, there is an unmistakable Art Deco feel inside Hilton Manila. Also noticeable are the accent pieces in Hilton Blue and Persian Green colors, perhaps reminiscent of the colors used in the logo of the former Manila Hilton. 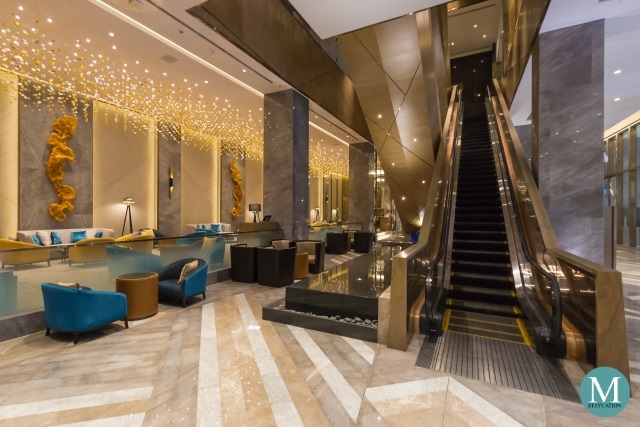 Cheching-in at Hilton Manila was a breeze, especially when you are a Hilton Honors member. No need to fill-out a registration form because they already have your personal details in the system. After making a security deposit of P5,000 per night and signing the registration form, our key cards were immediately handed to us. 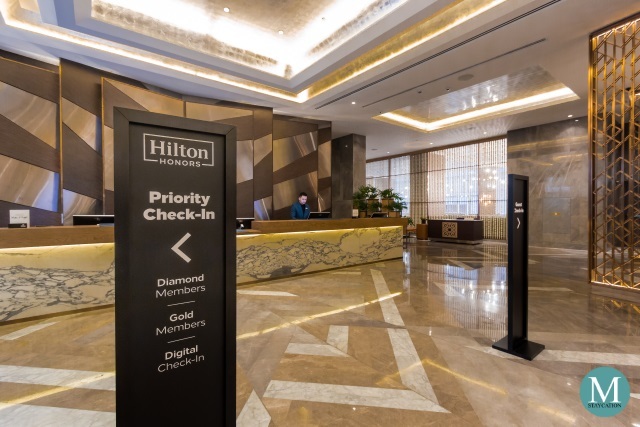 Diamond- and Gold-level members of the Hilton Honors loyalty program also enjoy priority check-in. 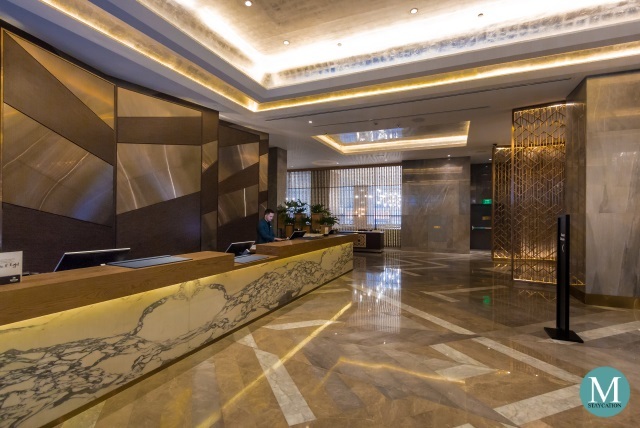 On a busy day, you can simply skip the line and approach the dedicated front desk for your priority check-in. This is only one of the many perks and privileges that loyal Hilton Honors guests can enjoy when staying at Hilton Manila. Join the Hilton Honors loyalty program for free. 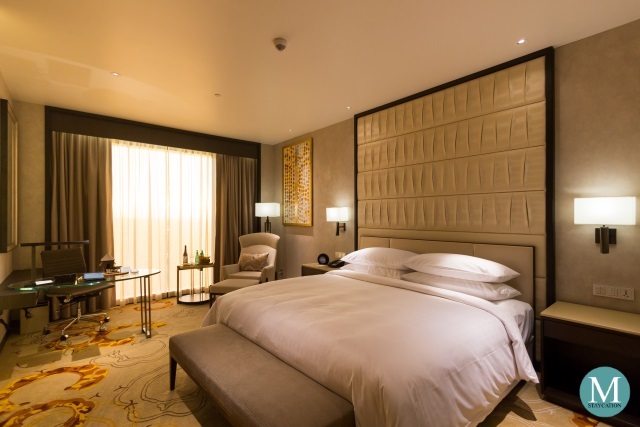 Hilton Manila has a total of 357 spacious and well-appointed guest rooms and suites. Guests can choose to stay in a room with a view of the city or of the pool. Connecting rooms as well as accessible rooms are also available. TIP: The Executive Room Pool View is the only room category with a veranda. 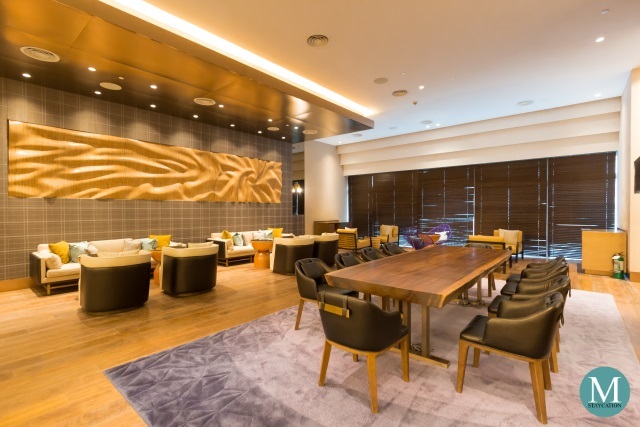 It is also conveniently located on the same floor as the Executive Lounge. 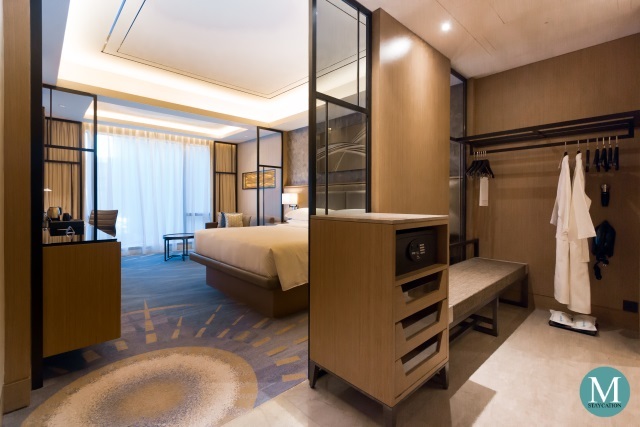 The Guest Room is the lead-in room category of Hilton Manila. Measuring 40 square meters, it is one of the most spacious lead-in hotel rooms in Metro Manila of the same category. 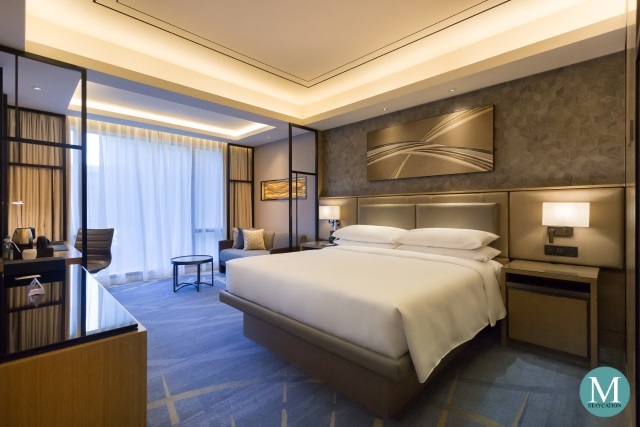 With more living space at a similar price point, the Guest Room at Hilton Manila offers great value for both business and leisure travelers. Located on the fifth floor, the Executive Lounge features comfortable seating areas as well as a meeting room and an entertainment room. There is also an al-fresco seating area which is perfect for in-between meeting breaks. Hilton Manila has assembled an amazing team of culinary experts to create some of the most exciting local and international dishes highlighted by the hotel's five dining outlets. The hotel is also home to some of the most unique dining destinations in Manila. Guests at Hilton Manila can choose a breakfast venue that best suits their schedule or dining preference. Semi-Buffet Breakfast at the Executive Lounge - guests staying in any of the Executive Rooms or Suites can dine at the exclusive Executive Lounge. The complimentary semi-buffet breakfast features a buffet of continental items plus breakfast dishes available from the a la carte menu. 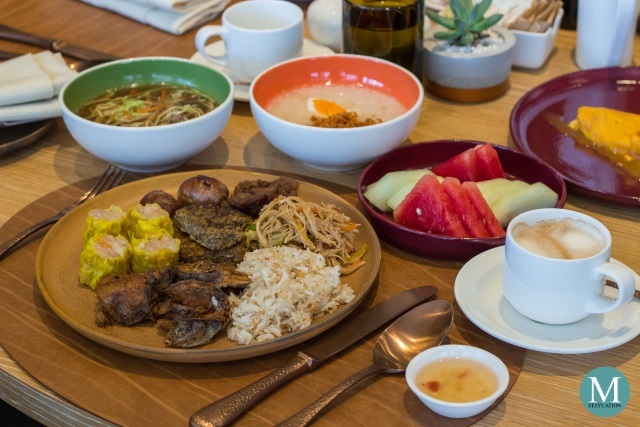 Lounge guests also have the option to enjoy their complimentary breakfast at Kusina Sea Kitchens. 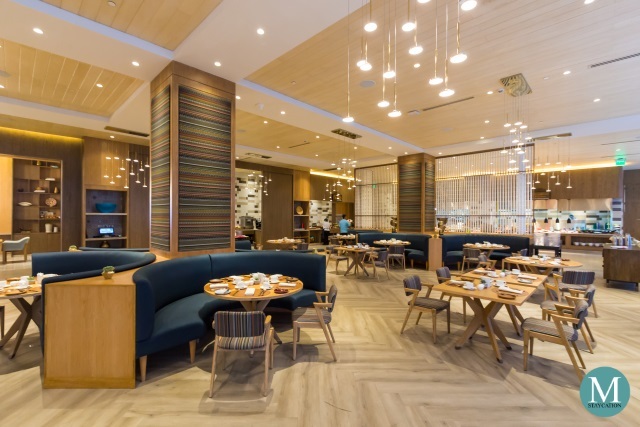 Grab-and-Go Breakfast at Madison Lounge & Bar - guests who are on a hurry to a meeting or an early morning trip in the city may opt for a grab-and-go breakfast at Madison Lounge & Bar. It serves freshly baked pastries and sandwiches. Take-away coffee and tea are also available. In-room Breakfast - guests who prefer to have their breakfast at the comfort and privacy of their room may order their choice of breakfast from the in-room breakfast menu. Choices include Continental, American, Asian and Filipino set breakfasts. Welcome Experience - Chinese guests are welcomed by a Mandarin-speaking staff of the hotel. A welcome note in Simplified Chinese is also part of the welcome amenity. 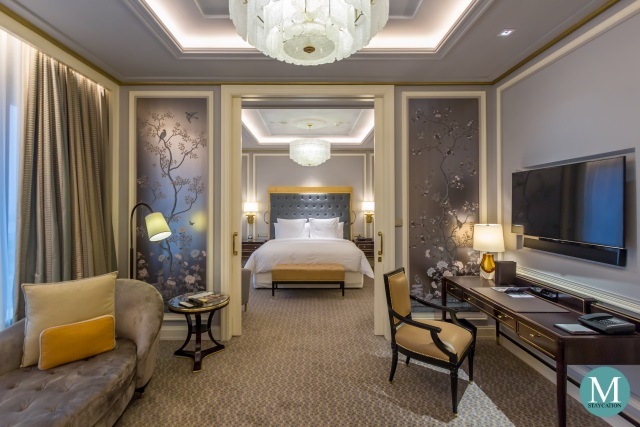 Guestroom Experience - complimentary Chinese tea, tea kettle as well as tea cups are part of in-room amenities, Mandarin-language cable channels are also available. 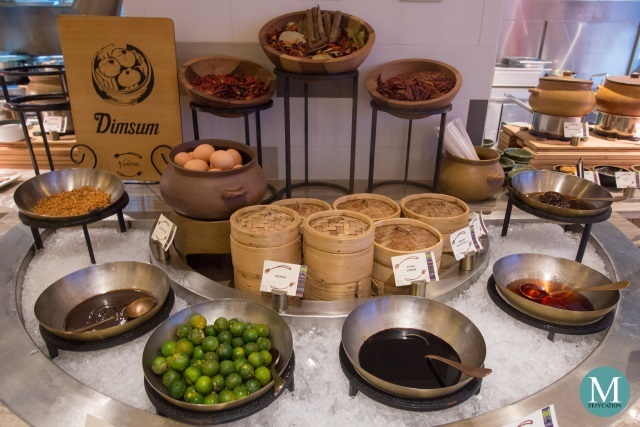 Breakfast Experience - the breakfast spread includes Chinese dishes such as congee with condiments, fried rice and/or fried noodles, a variety of dim sum, fried Chinese dough (youtiao), hard-boiled eggs, Chinese tea and soy milk. Keeping-up with your daily fitness program is possible even if you are on a leisure or business trip. 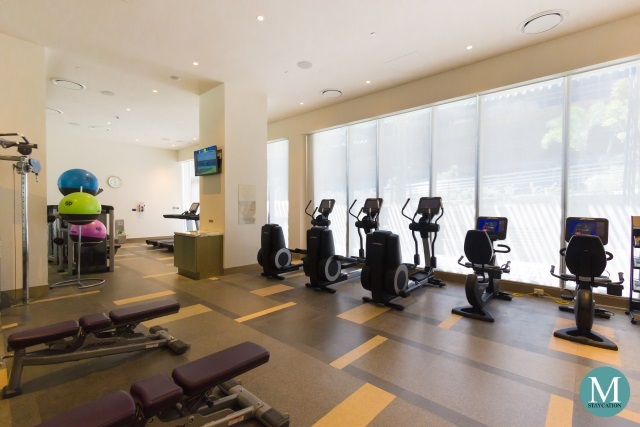 During your stay at Hilton Manila, you can keep yourself fit through the various fitness facilities available for you. 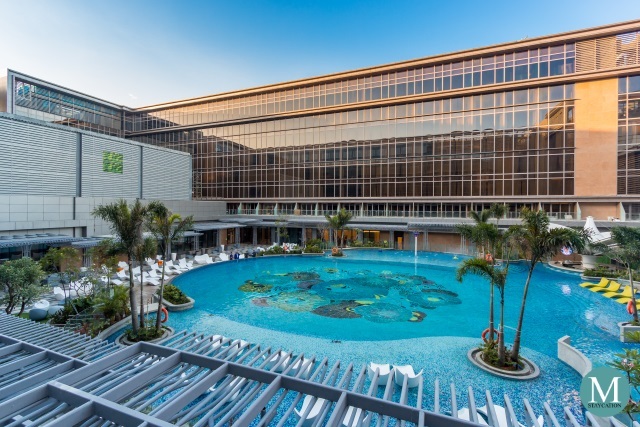 Swimming Pool - Hilton Manila features a free-form resort-style swimming pool that is perfect for families to enjoy their time together. The pool also has a sit-in bar where guests can cool down with their favorite chilled juices or cocktails. The swimming pool is open daily from 6:00am to 6:00pm. Fitness Center - equipped with state of the art LifeFitness work-out and weight training machines. The fitness center is open 24 hours do you can choose a work-out schedule that best suits your itinerary. Overall, we enjoyed our stay at Hilton Manila. All my expectations in a Hilton brand have been met. As always, the highlight of our stay was the sleep experience. The signature Serenity Bed never disappoints. Service is also excellent. All the staff are well trained and execution of customer service is at par with global standards for luxury hotels. Deciding if you too should stay here at Hilton Manila? Below are some pointers and recommendations to consider in order to make the most of your stay. 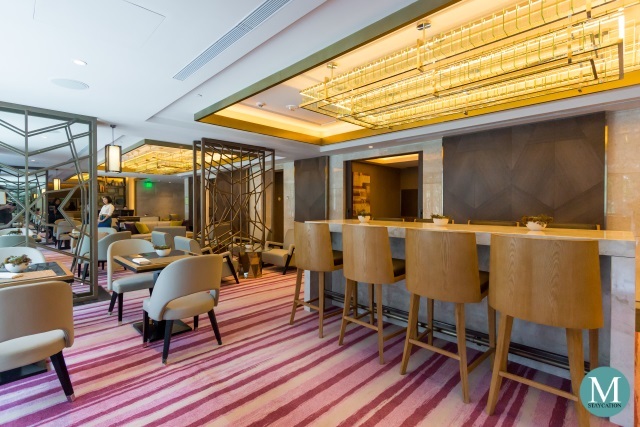 Business Travelers - If you will be holding meetings at the hotel, you can consider an Executive Room and take advantage of the Executive Lounge benefits, including the use of the meeting room and the business center services. If you need a more spacious work area inside your room, we highly recommend the One-Bedroom Deluxe Suite. You will surely love the comfortable bed. 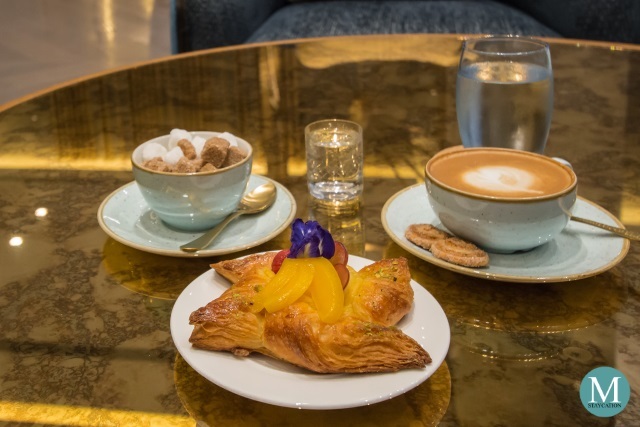 If you will be leaving the hotel early in the morning, you can order in-room breakfast or buy a grab-and-go sandwich and coffee at Madison Lounge & Bar which opens daily at 6:30am. Leisure Travelers - You will most probably be spending most of your day exploring attractions around Manila. Having said this, the Guest Room is the perfect room category for you. 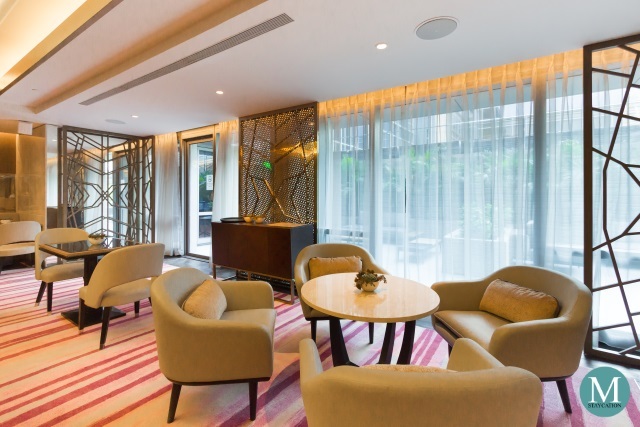 If you are traveling as a family or as a group, you may also consider to book connecting rooms or a suite. If your itinerary includes early morning activities, it is better to book a room without breakfast. Just order in-room breakfast or buy a grab-and-go breakfast at Madison. Staycations - Weekends are perfect for family staycations. Parents with small children may choose the Guest Room with double beds. Group of friends may request for connecting rooms. For a romantic staycation, do consider the Executive Room Pool View which is the only room category with a veranda. Don't miss out the breakfast buffet. The busiest time to avoid is between 9:00am and 10:00am. 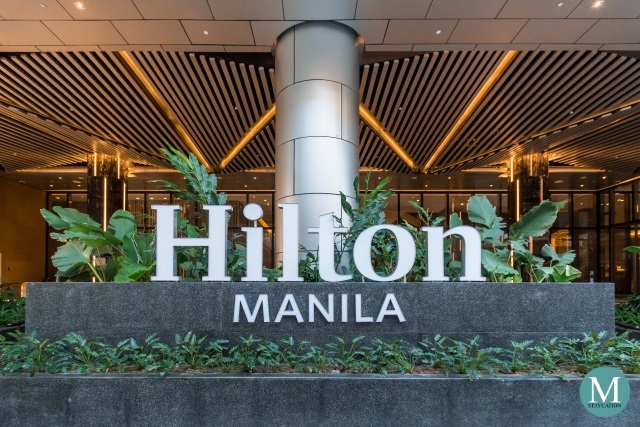 Hilton Manila Hotel is located right across the Terminal 3 of Manila's Ninoy Aquino International Airport, making the hotel and ideal base for guests flying in and out of Manila. The trip between the airport and the hotel takes between 15 to 30 minutes depending on the airport terminal. Airport Transfer (International Flights) - Guests arriving via Terminals 1, 2 and 3 may take advantage of the complimentary airport shuttle provided by Resorts World Manila (RWM). Just look for the RWM booth at the arrival area and tell them that you will be checking-in at Hilton Manila. Going back to the airport, the RWM shuttle also picks-up hotel guests every hour. Please register with concierge to make sure you are accommodated. Alternatively, you may also use the Grab ride hailing application. There is also a Grab booth at the arrival area which can book a ride for you. Grab fares are fixed and are quite reasonable. Airport Transfer (Domestic Flights) - If your flight arrives at or departs from Terminals 2 or 3, you may also use the complimentary RWM airport shuttle. The RWM airport shuttle however does not service guests arriving at or departing from Terminal 4. The best option for you is to use the Grab ride hailing application. Moving Around - For your transport needs around Manila, we highly recommend that you use the Grab ride hailing app. Fares are fixed and drivers are generally hospitable. We don't recommend taking the regular taxi if you are not a local. Just approach concierge if you need assistance.